Mother’s day is quickly approaching (May 10th by the way) and what better way to celebrate her day than with a special personalized gift. 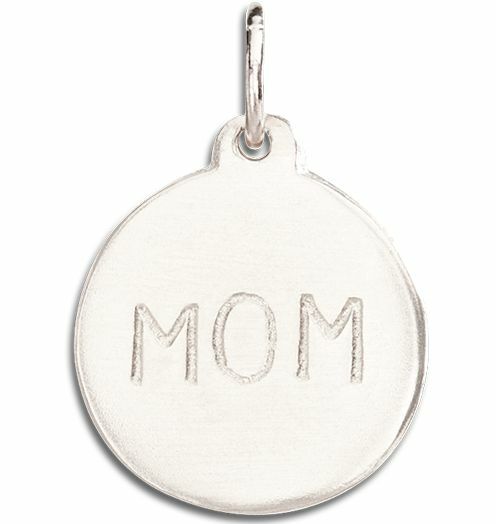 Today we are happy to bring you a product review for Helen Ficalora‘s sterling silver ‘Mom’ disc charm pendant necklace. Who is Helen Ficalora? Well for over a decade her timeless pieces have been well-known for her alphabet charm pendants which always make her jewelry stand out gifts. Her ‘Mom’ pendant is just as classic and is a top seller. It sits on a 18″ fine silver chain and retails for $95.00. We love how simple, dainty and lightweight the chain and the charm look and feel. Another great idea is so to combine multiple charms and Helen Ficalora makes that easy, as her line also carries charms with a variety of themes. Some of those themed styles include florals, birthstones, animals, spiritual, sports, zodiac and so much more. Also, if you prefer yellow, white or pink gold there are plenty of options for you as well. If you are looking for the perfect Mother’s day present for your Mom, Aunt, Grandmother, a Mom to be or special friend than we urge you to consider this great disc charm pendant. You are surely to make that special someone very happy. We love hearing from our readers and invite you to visit share your thoughts and comments below. Also, if you enjoyed this post please use the social media share buttons below. One Style at a Time Review: A timeless, delicate and affordable ‘Mom’ pendant that will make any Mother feel extra special. One Style at a Time product score: Out of five style hearts we give Helen Ficalora 5 golden stars. Disclaimer: I received the Helen Ficalora Mom Pendant for the purpose of this review. All thoughts are my own.